When considering dental implants, you need to know that they are one of the most modern and revolutionary ways to replace missing teeth. The sad part is that tooth loss is ageless and can occur for anyone at any stage in life. Young people are just as likely to lose a tooth if they are active in sports or other activities where there may be physical contact. For older folks, there is definitely a chance that they will lose some or all their teeth due to disease or age. Tooth loss creates a very drastic change in lifestyle, especially if an individual loses more than one tooth. Teeth play an essential role in the formation and enunciation of words. When a person loses his or her teeth, speaking becomes more difficult. Along with speech issues, people who lose teeth also struggle with a sense of self-consciousness, causing them to smile less. Finally, and most obviously, you have to change your lifestyle because you are no longer able to eat the food you love. Chewing becomes more challenging as you lose teeth. The answer to all of these problems is dental implants, the modern alternative to living with tooth loss. Here is how they work. Dental implants consist of two parts. The first is the dental implant itself that sits inside the jawbone and under the gum tissue, completely hidden from sight. This dental implant is fundamentally a tiny screw. The cone shape of the screw allows for it to be drilled into the jawbone for maximum strength and stability, and the flat head allows the second part of the tooth to be connected to it. This upper portion of the implant is also called a dental crown. Dental crowns are made of porcelain and look and feel exactly like a perfectly natural tooth. They are placed on an abutment to connect to the dental implant permanently. When you get a dental implant, you leave with a tooth that is as secure and stable as your natural teeth. There are no extra steps you need to take to care for it, and there is no hassle of removing it at night. There are many benefits to getting dental implants. What we hear the most from our patients are the convenience and permanence factors. Once dental implants have been placed into your mouth, there is no need to ever remove them. Unlike dentures, these are solutions that closely resemble the form and function of your natural teeth, which means you do not have to remove, especially clean, or take any extra effort with them whatsoever. Cleaning them involves your regular oral health routines. If you are the kind of person who brushes your teeth at least twice per day, rinses your mouth after meals, visits your dentist at least twice per year, and uses floss on a regular basis, your dental implants will get all that same care. 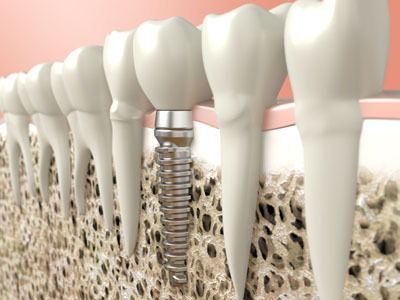 Dental implants are literally changing the way we think about tooth loss. Live in Costa Mesa, CA and have questions about dental implants? Give us a call at (714) 545-7157.